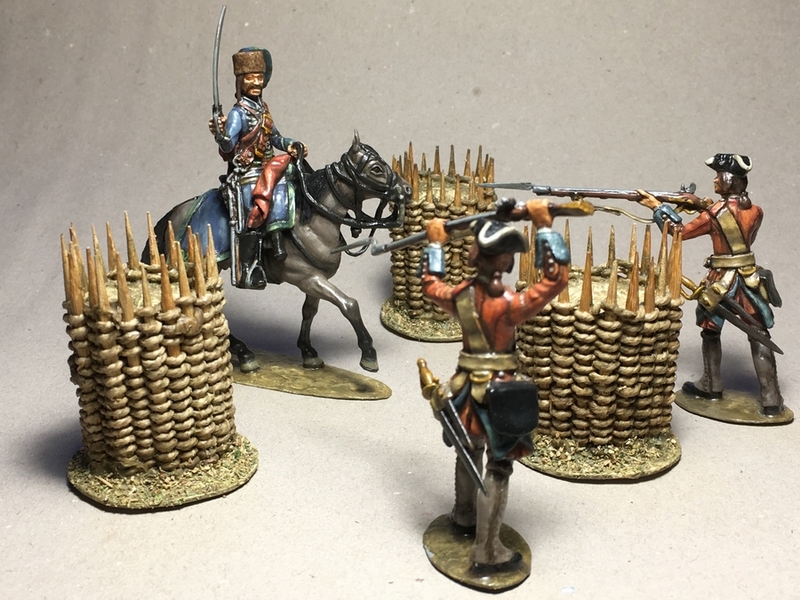 I decided that my first light cavalrymen should be French hussars, so as to employ them against my British regulars. By the time of the War of the Austrian Succession, most hussars in the French service were no longer recruited in Hungary as had been the norm during the 1720s and 1730s. For the most part they were now Germans, although other nationalities were also represented, including of course Frenchmen, and even a few Tatars and Turks. They all wore the Hungarian hussar dress and as such were hardly distinguishable from their counterparts serving with the Austrians, even more so as Hungarian prisoners and deserters, being valued Petite Guerre specialists, were offered to enter French service, and often joined in together with their mount and equipment. The French military authorities strived to enforce at least uniformity of dress, and by the mid 1740s all French Hussars regiments were supposed to wear sky-blue uniforms. In a further effort to make their own hussars more easily discernable from those of the enemy, in 1747 the French military authorities ordered fur hats replaced with white felt caps with the wing in the regimental color, but these did not meet with the hussars’ favor and in the event had to be replaced with black ones in 1755. Some modern authors show mid 18th Century French hussars as wearing distinctive, slightly pointed fur hats, but I found no evidence of this in the (admittedly very few) primary sources known to me. Therefore, for my War of the Austrian Succession French hussars I will use the same heads as for their Hungarian counterparts. I may decide to sculpt French hussar’s heads in felt caps at a future time, though, which will make them suitable for the Seven Years War period. On account of the above, my French hussars will be distinguishable from their foes only by the color scheme of their uniforms and by the devices on the saddle-cloth and Säbeltasche. Out of the seven regular hussar regiments on the French establishment during the 1740s, five (Rattzky’s, Beausobre’s, Raugrave’s, Polleresky’s and Ferrari de Interiani’s) had one single fleur-de-lis appliqué sewn at each corner of the saddle-cloth, and one on the Säbeltasche. As for the remaining two regiments, Berchény’s had one fleur-de-lis surmounted by a stylized crown, and Esterhàzy’s had the King’s cipher (but got the fleur-de-lis in 1744, when it became David’s and later Turpin’s).